The fourth model in the Range Rover line-up sits in the price and size gap between the Evoque and the Range Rover Sport. 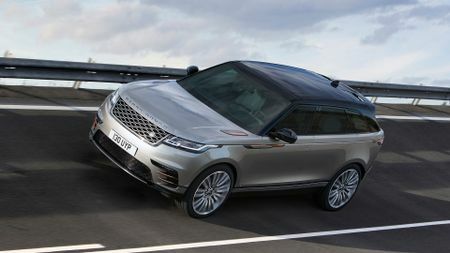 This is the Range Rover Velar, a sporty new SUV from Land Rover that will compete against the likes of the Porsche Macan, Mercedes-Benz GLE Coupe and BMW X6. The fourth model in the Range Rover line-up sits in the price- and size gap between the Evoque (which costs from £30,000) and the Range Rover Sport (from £60,000). The Velar range starts at £44,830, running up to the P380 First Edition at £85,450. The new car will be shown in public for the first time at the Geneva Motor Show on March 7, and is named after the 26 pre-production versions of the original Range Rover from the 1960s. The name was used whenever development engineers needed to hide the true identity of the models. Visually, the Velar is related to its Range Rover siblings, but adds some clever new touches, such as retractable door handles. LED headlights are standard, with four different designs available, up to top-of-the-range adaptive matrix-laser headlights, which give a brighter beam but cast shadows over oncoming cars. According to Land Rover, these have an impressive 550-metre range. Every Velar gets alloy wheels as standard, ranging from 18-22 inches in diameter, and in a choice of four finishes. Both the standard Velar and sportier Velar R-Dynamic models will be available; and, both come in a choice of four trim levels: Standard, S, SE, and the fully-loaded HSE. Special First Edition models will also be sold and they come with even more kit than HSE models, including full leather interior, a Meridian Signature Sound System, 22-inch wheels and an exclusive Flux Silver satin paint. Inside, the Velar features a new Touch Screen Duo infotainment system: a 10-inch touch-screen that rises up from the dashboard, and a second 10-inch touch-screen below showing car information. Two large dials can also be used to operate the screens. Another digital display sits in front of the driver, showing different information, and the controls on the steering wheel allow scrolling, too. 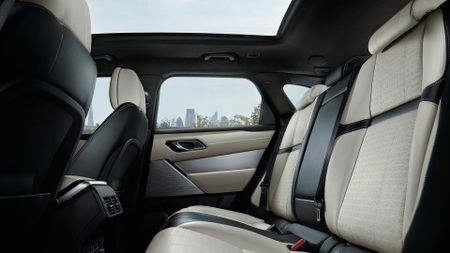 Land Rover promises plenty of interior space for five, as well as plenty of connectivity options, including up to four USB charging points and a WiFi hotspot for up to eight devices. Four different sound systems are available, as is a head-up display. The boot has 632 litres of space, considerably more than the Macan, and that’s with a space-saver spare wheel included as standard. Fold down the second row of seats, and that expands to 1731 litres. The Velar is predominantly made from aluminium to minimise weight, with steel and magnesium to add stiffness. And it’s got a permanent all-wheel drive system designed to send torque to whatever axle needs it the most. 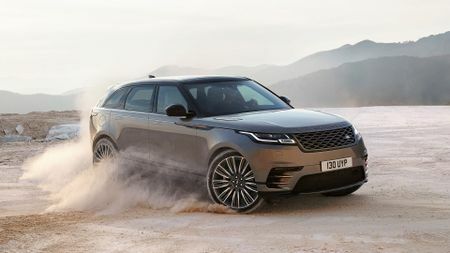 Being a Land Rover, there are expectations of excellent off-road performance, and the Velar is crammed with features to help it tackle tough terrain. It can cope with up to 650mm of water, and wade-sensing technology displays the water level on the screen inside. Opt for air suspension (which is standard on six-cylinder models) and you’ll get more than 250mm of ground clearance, while standard cars have 213mm. Hill Descent Control is standard on all models, as is Gradient Release Control, which allows a smooth getaway from standstill on a hill. Optional systems include Terrain Response 2, which automatically switches the car to the best set-up for different surfaces, and All Terrain Progress Control, which is akin to an off-road cruise control. 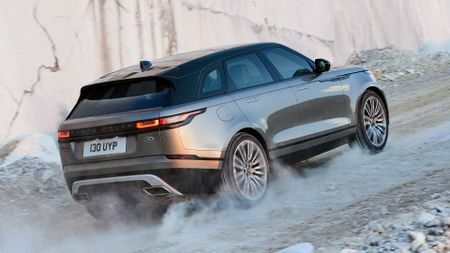 There’s also the optional Advanced Tow Assist function, which lets the driver reverse the Velar – with trailer attached – using one of the infotainment dials, with no need to counter-steer. The car has a towing capacity of up to 2,500kg. Safety kit includes Autonomous Emergency Braking with Pedestrian Detection, Lane Departure Warning and Lane Keep Assist – which help prevent drivers drifting out of their lane – Driver Condition Monitoring (which monitors driver inputs to detect drowsiness and issue any necessary warning) and Traffic Sign Recognition, which uses a camera to read speed limit signs and display them in the car. Six engines have been announced for the Velar, all mated to an eight-speed automatic gearbox, and five of which will be available at launch. They include a 2.0-litre Ingenium petrol engine developing 247bhp, which will be joined later in the year by a 296bhp version. A supercharged 3.0-litre V6 with 375bhp will target the slightly more powerful Porsche Macan Turbo. The diesel line-up includes two 2.0-litre Ingenium units with either 178 or 237bhp, and a 3.0-litre V6 with 296bhp. The lowest-powered diesel emits just 142g/km. After appearing at next week's Geneva Show, the Velar goes on sale in the UK in the summer. Interested in buying a Land Rover Range Rover?